I graduated High School from Lamar County in 2010. I went to Georgia Southwestern State University on a baseball scholarship where I received my Associates degree. I transferred to Toccoa Falls College in 2014 where I received my bachelors degree in Secondary History and Theology. This is my second year at Cook County Middle School. I teach 6th grade World History. I also coach Softball and Baseball for the High School. My name is Michael Sneed. I am from Barnesville Georgia and graduated High School in 2010. I attended GSW where I played baseball for 3 years. In 2014 I transferred to Toccoa Falls College where I finished my collegiate career and obtained my degree in Secondary History and Theology. While I was at TFC I competed for two national championships in Baseball in Prasco, Ohio for the NCCAA World Series. 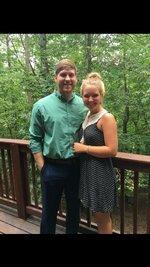 I am married to Kayla Sneed who is currently finishing up her undergrad at ABAC.